We at Regan McEntee & Partners advise all of our clients to make a Will. When making a Will, you can give effect to your intentions. 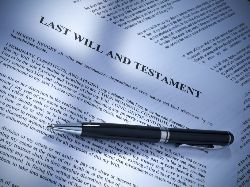 If a person dies without having a Will made, the State will determine how that person’s property is divided according to the rules of intestacy which are provided for in the Succession Act, 1965. We advise people to make a Will as soon as possible. A Will can be changed at any stage, so if circumstances change going into the future, these can be provided for in a new Will. Telephone the office on 046 9431202 to arrange an appointment to call in to discuss everything. Young Children: If you have young children we would suggest that you provide for your children in the form of a Trust and we advise in relation to all aspects of this. Family Law Clients: If you are separated or divorced, we advise on all aspects and if you have children, we suggest that you might like to appoint a Testamentary Guardian under your Will. Children / Family Member with special needs: If you have a child with special needs, we can advise you on the various options open to you and we have extensive experience in this area. An Enduring Power of Attorney is a mechanism whereby you can appoint somebody (attorney) to look after your affairs, if in the event God forbid of you becoming mentally incapacitated at any stage in the future. It is important to note that you are only handing over control if you become mentally (as opposed to physically) incapacitated. Presently, the only alternative to an Enduring Power of Attorney, is the more expensive option of making a person a Ward of Court. We are currently waiting a Commencement date for the Capacity Act. The death of a loved one naturally causes huge sadness and upset in a family. It can also be a time of great upset to normal life. We are very aware of this sensitive time. When somebody dies having made a Will they are said to have died testate and when somebody dies without having made a Will they are said to have died intestate. Where assets were held in the sole name of the deceased, it becomes necessary to take out a Grant in order for the next of kin to access the deceased’s property. We advise on all areas of the administration.